European Corn Borer (ECB) adult catches, although low, are beginning to increase now in some areas. Highest activity at this time is near the Burlington-Monmouth-Ocean County border (see ECB map). The first signs of whorl stage plants with ECB damage are starting to appear. As always, consider treating if 12% or more plants exhibit ECB feeding alone, or in combination with FAW (see below) injury. Remember to make a full-tassel application to control ECB larvae as they leave the tassel and travel down the stalk to re-enter the plant near the ear shank. This last application is often critical to controlling ear infestations from ECB. Blacklight Trap Corn Earworm Moth (CEW): Corn earworm moths (CEW) catches are largely unchanged in blacklight traps in the southern part of the state, with a few light catches still occurring in central counties (see CEW map). No CEW individuals have been captured north of Monmouth County as yet. Overall, catches are reasonably low. Catches from a few of the Virginia light traps are showing signs of increase. These catches are an indication that CEW emergence may be beginning. As this situation progresses, warnings will be posted here. We should expect gradual increases in adults now until the major migratory push that typically comes in mid-August. Pheromone Trap Corn Earworm Moth (CEW): Catches are also reasonably stable, with somewhat higher catches neat the Atlantic-Camden County border (see CEW pheromone trap map). The green area on the map roughly corresponds to a 4-day silk spray schedule. Low spots within the broader green area should be considered outliers, and grower near those areas should defer to the more conservative schedule. Blacklight and pheromone traps match in terms of where most moth activity is occurring. 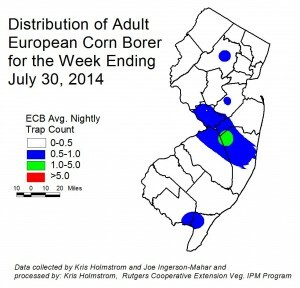 Sweet corn plantings now in silk in southern NJ are at risk for ear infestation if CEW is not properly controlled. As silks begin to appear, pay close attention to CEW catches in local blacklight traps, and treat silking plantings accordingly. Fall armyworm (FAW) infestations continue to increase steadily. Although the most consistent infestations remain in coastal areas, infestations have been spreading north and west, with damage now into Warren County. 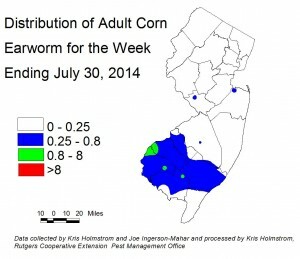 Whorl stage infestations above the 12% threshold have been found as far north as Hunterdon County. FAW caterpillars consume corn foliage, and produce large quantities of feces that pile up within the whorl. FAW larvae typically have light and dark brown bands, and the head capsule has a distinctive upside-down “Y” pattern on it. Unlike ECB, FAW will feed on corn plantings in the seedling stage, although whorl stage is usually the first to be affected. Consider treating if the number of plants infested with FAW either alone, or in combination with ECB exceeds 12%. FAW may be difficult to control with pyrethroid insecticides. Newer materials, including spinosad-based insecticides, as well as those including active ingredients chlorantraniliprole and flubendiamide are effective against BAW. Beet armyworm (BAW) have been captured in southern counties, but numbers remain fairly low. As moth catches increase, or pepper infestations occur, information will follow. Pepper Weevil Report. No pepper weevils have been caught in the past week. No reports of infested fields. Hopefully, this trend continues. As noted earlier in the summer, most of the field infestations occur from mid-August on into September. There is no map this week. Native brown stinkbugs are increasing in tomatoes. Typically, injury increases with drier weather. Be sure to monitor fruit for this damage. If adults are found in more than one sample, or if nymph groups are found, or injury is increasing in harvested fruit, consider an insecticide application to limit further damage. Consult the 2014 Commercial Vegetable Production Recommendations for specific insecticide recommendations. BMSB activity rises slightly with warmer evening temperatures and falls again as nights cool. Catches are very low overall in blacklight traps. Adult activity continues to be well behind previous years. As adult captures increase to 5/night for a full week, maps will be produced to show where activity is highest. Information on scouting, crop injury and control will also be included. These crops are setting fruit in many areas. As fruit begin to appear and enlarge, the appearance of powdery mildew (PM) will follow. PM thresholds have been reached this week in several of the earlier planted fields in northern NJ. Check upper and lower surfaces of 2 mature leaves per plant on 5 consecutive plants each, in 10 locations throughout the field. When PM lesions are found on 2 or more leaves, begin a weekly protectant fungicide program. See the 2014 Commercial Vegetable Production Recommendations for materials useful in managing PM. A sentinel plot containing susceptible and resistant cucumber varieties, as well as muskmelons, watermelons, acorn and butternut squash and pumpkins is now established at the Snyder Research and Extension Farm in Hunterdon County and another was established at RAREC in mid-July. The purpose of these plots is to detect the presence of CDM in NJ. Vines at Snyder Farm are fruiting, and no DM has been observed as yet in the plot. The CDM website http://cdm.ipmpipe.org/ has New Jersey at “low risk” for further infection, except near current outbreaks. This website should be a “favorite” on every grower’s web browser. As yet, northern and central counties appear to be free of CDM, but this could change any time, particularly on cucumbers. It is advisable that all growers scout crops at least twice a week, and begin to apply CDM specific fungicides at least to the cucumber crop. Any further occurrence will be reported in this newsletter and will also generate an alert to all subscribers. See the 2014 Commercial Vegetable Production Recommendations for materials useful in managing CDM. Questions about yellowing basil leaves are coming in regularly now. 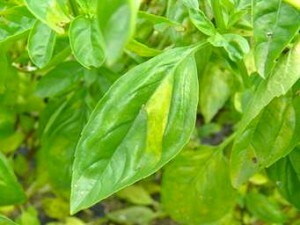 Basil plantings all over the state are at extreme risk of developing basil downy mildew (BDM). This disease attacks Genovese type sweet basil in particular, but will also impact other tender-leafed varieties. Once the disease infects plants, the leaves are not marketable. Therefore, BDM must be prevented. The photographs here show BDM symptoms on the upper leaf surface (yellowed areas bordered by leaf veins), and actual sporulation of the fungus on the lower leaf surface. Fungicides in FRAC group 33 (phosphorous acid salts including K-Phite, Prophyte, etc.) are useful for management of this disease. 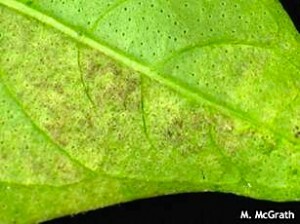 For information on the disease, as well as other recommended control products, see the following article by Dr. Margaret McGrath of Cornell: Expect and Prepare for Downy Mildew in Basil.